Research in the Department of Plant Pathology and Weed Research focuses on fungal, bacterial, viral pathogens and noxious weeds causing damage to agricultural crops in Israel and abroad. To lead research and technology development in managing biotic crop damage while maintaining the values of sustainable agriculture and quality production. Develop knowledge and technology for disease control and to maintain quality of agricultural produce while minimizing environmental damage. 1. Study the relationships between the environment and pathogens and weeds affecting agricultural crops. 2. Identifying and describing the pathological and weed problems limiting agricultural production. 3. Development of efficient, environmentally-friendly methods for solving pathological and noxious weed problems limiting agricultural production. 4. Distribution of knowledge and techniques developed for the benefit of growers and industry in Israel and abroad. 5. Development of practical applications in plant pathology and weed science. 6. Development of the next generation of researchers in plant pathology and weed science. • Epidemiology of disease and causal agents. • Development and application of methods for assessing susceptibility to disease-causing agents. • Development of plant resistance, agrotechnical methods and decision support systems for disease reduction. • Development and assessment of biological and other non-chemical control agents. • Identification and isolation of pathogenicity genes involved in disease development. • Identification and characterization of genes involved in the plant host response to disease agents. • Biological control of weeds. • Intelligent chemical control of weeds. • Development of decision support systems for precision control of weeds. • Developing parasitic-weed resistant crops. Bar Maya, Ph.D. Group Leader (PI): The involvement of cellular processes and structure-function relationships in plant defense, plant pathogen interactions, and biocontrol. Ezra David, Ph.D. Fungal fruit tree diseases: Mal secco disease of citrus Alternaria brown spot and black spot disease of citrus Disease of pomegranate Alternaria in persimmon The molecular relations between pathogenic fungi and their host Biological control of fruit trees pathogens by the use of endophytic microorganisms and their secreted secondary metabolites. Biological control of diseases in fruit trees their products and seeds by Volatile Organic Compounds emitting fungi. Gal-On Amit, Ph.D. 1.The molecular basis of host and positive-strand RNA virus interaction. 2. The role of RNA-dependent RNA polymerase 1 in plant virus defense. 3. Identification of plant genes associated with disease symptom development to plant virus infection. 4. CRISPR/Cas9 genome editing technology for crop improvement. 5.Genetic engineering of attenuated ZYMV-AG as a plant virus vector, for gene expression and epitope presentation. 6. Development of resistance to RNA and DNA viruses, in cucurbits and tomato by transgenic approaches. Mawassi Munir, Ph.D. Engineering of grapevine virus-based transient expression vectors. 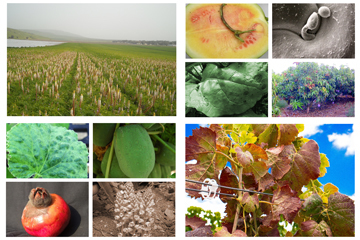 Development of methods for detection of grapevine and citrus viruses. Molecular biology of grapevine Closteroviruses and Vitiviruses. Molecular biology of citrus tristeza virus. Etiology of grapevine rugose wood complex and leafroll diseases. Elimination of viruses from grapevine tissue by thermotherapy, meristem culture, and cryopreservation Phytoplasmal deseases in grapevines. Shtienberg Dani, Prof. •Epidemiology of plant disease. •Crop loss assessment. •Development of decision support systems, IPM and modeling. •Host-pathogen interactions at the population level. Bar Joseph Moshe, Prof. Management and control of virus and virus like disease agents of subtropical fruit trees, with special emphasis on citrus. Certification programs, nursery propagation methods and modern cultivation practices of citrus & subtropical fruit trees . Eradication policies and practices of potentialy epidemic disease agents of fruit trees. Phytoplasma, Spiroplasma and insect vectored disease agents of citrus and subtropical fruit trees Molecular characterization and evolution of Closteroviridae and of viroid disease agents. Methods of pathogen detection and elimination. Transgenic plants (citrus) and rapid propagation technologies. Elad Yigal, Prof. Diseases of covered crops; Foliar diseases; Integrated management; Low input management, Global climate change effect on agriculture, plants and plant diseases; Mitigation and adaptation to climate change; Plant-Pathogen-Microb interactions. Special emphasis on cultural, chemical, biological and integrated control, epidemiology, physiology and parasitism; Biocontrol agents. Haas Jerry H, Ph.D. Ecology and epidemiology of soil-borne fungal pathogens and mycorrhiza. Kritzman Giora, Ph.D. Plant Pathologist & phytobacteriologist: Soil borne,seed borne and water borne pathogens.Bacterial diseases. Manulis-Sasson Shulamit, Ph.D. Studies on molecular basis of bacterial-host interactions, cloning and characterization of pathogenicity genes, development and implementation of molecular techniques for detection of major and economically important bacterial diseases: Pantoea agglomerans pv. gypsophilae, Xanthomonas campestris pv. pelargonii, Clavibacter michiganensis subsp. michiganensis, Erwinia amylovora, Agrobacterium tumefaciens. Solel Zvi, Ph.D. Fungal diseases of citrus. Epidemiology, resistance and chemical control of plant diseases caused by fungi.